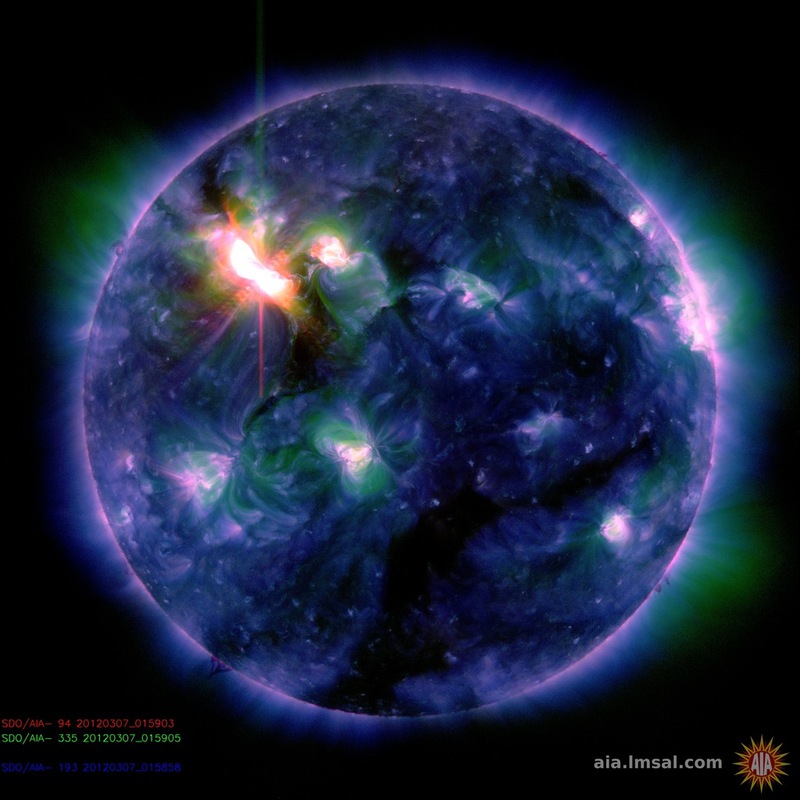 NOAA: Strong Solar Eruption; Earth-Directed CME Likely | Watts Up With That? 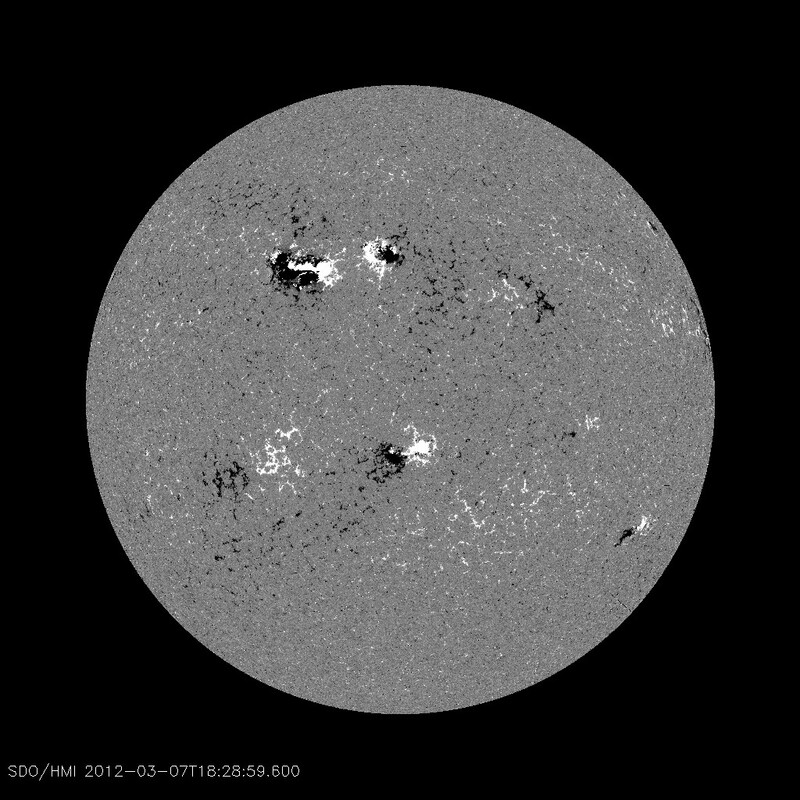 An X-5 class solar flare just occurred from region 1429, the large active sunspot group seen below. An R3 (Strong) Radio Blackout is now in progress, beginning about 7:00 p.m. EST today. The site of the eruption, previously active Region 1429, is now near center disk, so there’s high-potential of an earth-directed CME (coronal mass ejection). In addition, expect the imminent beginning of a Solar Radiation Storm. Analysis now occurring on both fronts, watch here for updates. 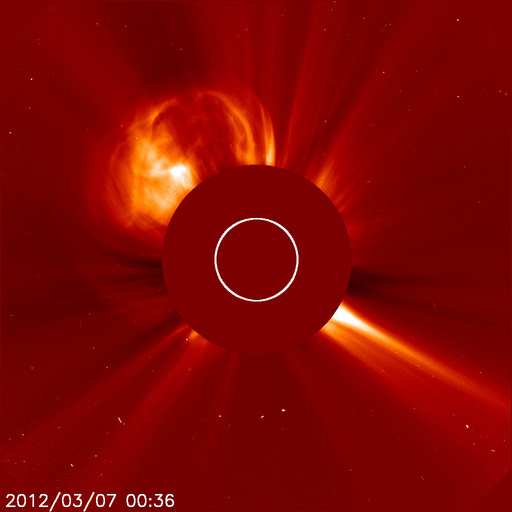 The CME that erupted late on March 4 passed ACE around 0400 UTC March 7 (11:00 p.m. EST March 6). Look for G1 (minor) Geomagnetic Storm activity in the next few hours. Another CME, part of the recent R3 (strong) Radio Blackout event at 0024 UTC March 7 (7:24 p.m. EST March 6) is forecast to pass ACE about one day hence. Predictions are still being refined on this one. Finally a Solar Radiation Storm is now building as the higher energies are showing a response to the recent eruption. The S1 (minor) threshold should be surpassed in the next few hours. Updates here as conditions warrant. High-latitude sky watchers should be alert for auroras on March 6th and 7th. 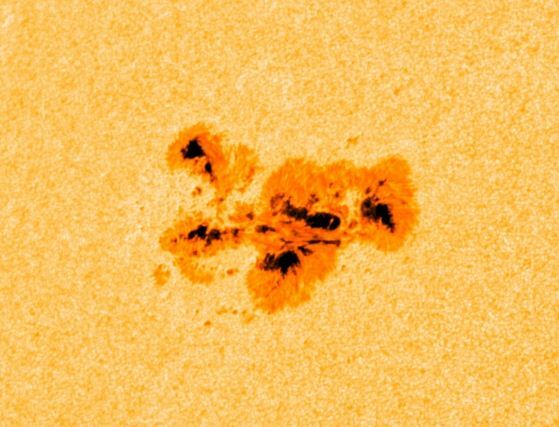 Sunspot AR1429 has hurled two CMEs into space since it emerged over the weekend. Neither cloud is heading directly toward Earth, but both could deliver glancing blows to our planet’s magnetic field. 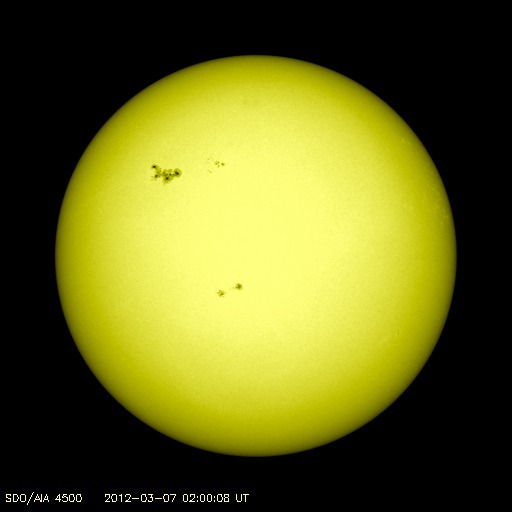 NOAA forecasters say there is a 30% to 40% chance of polar geomagnetic storms during the next 24-48 hours. This eruption hurled a bright CME into space. First-look data from STEREO-B are not sufficient to determine if the cloud is heading for Earth. Our best guess is “probably, yes, but not directly toward Earth.” A glancing blow to our planet’s magnetosphere is possible on March 8th or 9th. Looks like we dodged the bullet for the major bullseye from those, but some disruption is likely from this last X-5 event. We’ll monitor and report as needed. GEOMAGNETIC STORM UPDATE: A CME propelled toward Earth by this morning’s X5-class solar flare is expected to reach our planet on March 8th at 0625 UT/725EST/1025PST (+/- 7 hr). Analysts at the Goddard Space Weather Lab, who prepared the CME’s forecast track, say the impact could spark a strong-to-severe geomagnetic storm. Sky watchers at all latitudes should be alert for auroras. Here we go. These can be quite destructive. A little of topic, but definitely for a solar thread. Why do not stars have a ‘GHG’ problem? Stars start my fusing hydrogen to helium, both species have very little X-ray absorbance. As they begin their burn they make larger atoms, in trace amounts.Shouldn’t these heaver elements constantly absorb, the re-radiate inwards, half the energy they absorb? As there is a continuous increase in heavier, and more X-ray absorbing, elements, should stars go into run away heating? http://science.slashdot.org/story/12/03/02/1438241/one-in-eight-chance-of-a-financially-catastrophic-solar-storm-by-2020 has a slightly different take on the chances of a catastrophe caused by activity on the sun. My bad. This is totally my fault. My Mom always told me, “Don’t stare at the sun or bad things will happen.” Well today, I ignored her, and did. I’m pretty sure that’s why it’s sending us a solar flare. Also, things suddenly seem pretty blurry. Is that happening with everyone, or just me? As one who dreads traveling . . . But not in an auto, apparently. Check the modes of transportation for chances of accidents and such. Getting to the airport is more an issue than the airplane, and as Anthony says, relax. I wonder what we will learn from this event? Although very strong, its aim is off. Still interesting. A bit serendipitous given the BBC’s Horizon program last night (UTC). There is a new kind of weather to worry about, and it comes from our nearest star. Scientists are expecting a fit of violent activity on the sun which will propel billions of tonnes of superheated gas and pulses of energy towards our planet. They have the power to close down our modern technological civilisation – e.g. in 1989, a solar storm cut off the power to the Canadian city of Quebec. Horizon meets the space weathermen who are trying to predict what is coming our way, and organistions like the National Grid, who are preparing for the impending solar storms. Excellent. Available here for those with access to BBC iPlayer. You ARE a little blurry! But everything else seems OK…. must be just you?! After the debris field clears, our Sun will be a relatively dead white dwarf. But we won’t care–we’ll be long gone by then. We have some partially clear skies in the Seattle area tonight! Maybe, if there ARE aurora tonight, we just might be able to see them!!! Oh Please… Oh Please! I haven’t seen really dramatic northern lights since the mid ’70s, in central Wisconsin. In the summer of 1974 (or was it 1975…. hmmm), I returned home (SW end of Big Green Lake) in the wee hours of the morning, on a very dark ‘no moon’ night. When I climbed out of the car, I realized I could see aurora to the north. As my night vision sharpened further, I could see the aurora were streaming all over the sky, even somewhat south of my position! These were no wimpy wisps of gossamer silver – no! They were shimmering waves of silver, gold, and green, rippling from the northern horizon to south of my local ‘overhead’ view! When I realized it was not a momentary display, I ran in the house, grabbed a lawn chair and a couple of beers, and watched until false dawn was liming the eastern horizon. I’d really like to see something like that again… but it might just be a real ‘once in a life time’ display. Que lastima… But I’ll be watching. This isn’t going to alter the Van Allen Belts and make machines come alive and attack us is it? Every time that happens I have to send so much of my disposable income replacing the homicidal hardware that it really affects my hallucinogenics budget. karlac…as Anthony suggests,relax,have a couple of brewskis,and flirt with the good looking stewardesses! After a 22 yr stint being a flight engineer and over 10K flying hours,and only two lighting strikes and 3 “tricky” landings,I can assure you NO aircraft has ever crashed due to solar activity. You have a better chance hurting yourself going down the aisle to the bathroom. Rats.All the great activity,and here in Edmonton,AB,Canuckland, we have low clouds and snow. Ah well,maybe next time. A major east coast university, backed by certain experts at NASA, will release a study tomorrow linking man made global warming to major disruptions in the sun’s weather as well as significant negative effects on women’s reproductive rights. If I am not mistaken, here appears to be something wrong with the plotting of the latest point on NASA’s Spaceweather sunspot count graph. The point seems to have been inserted prior to the previous point, instead of after it. This appears on both their website and WUWT’s solar reference page. (This is obvious to anyone who looked it a week ago, before the graph was updated). Or have they dramatically revised down the previous data point, and is this unusual? On the topic of flares. What was the estimated power of the Carrignton event? X-? As an amateur sun watcher, I would take a stab that the Carrington Event was at least X100 or so (no kidding)– we haven’t seen anything like it again (yet). About time the sun wakes up. I think the sunspot numbers were in the 20s last week. Today http://www.spaceweather.com says its up to 109. “My bad. This is totally my fault. My Mom always told me, “Don’t stare at the sun or bad things will happen.” Well today, I ignored her, and did. I’m pretty sure that’s why it’s sending us a solar flare. Oh, I get it… you were trying to use a magnifying glass to light your uh, pipe. Tonight’s BBC Horizon program included a segment featuring Stathis Ilonidis from Stanford about helioseismology, on site at Big Bear. Was region 1429 detected before it surfaced? There was also a segment featuring Matt Penn describing the L & P effect where he ended by saying that may mean space weather is calmer in future. But curiously this seemed to be abruptly edited before he’d finished what he was saying. Throughout the program there was the theme that “solar experts expect violent solar storms over the next two years” but no explanation why. Aside from the spikiness of weak cycles is there something else you guys have figured out, where does this two year theme come from? I believe you are correct, Barry. X minus question mark is the answer. Now there are some who might say the answer is X minus dot dot dot question mark, but, imo, those dots are ambiguous at best, and misleading at worst. They simply don’t belong in the equation. As a ham radio operator – ‘Oh crap’. Hopefully it will be short lived. The point of eruption on the sun is NOT in line with the Earth, it is also above the sun’s equator. Okay, it is an expanding bubble that could graze the Earth. Why all the panic mongering? The Earth has experienced bigger CMEs in the recent past without catastrophic effect. Maybe it’s just coincidence, but earlier this evening I managed to catch sight of a brilliant green wisp of aurora that was clearly visible even above the street lights while I was driving. I pointed it out to my passenger and she was amazed. Unfortunately the clouds seem to have descended now. Have you got spots before your eyes? Changing from yellow to green? Can you still see the sun with your eyes shut? From the image on your side bar, it looks like it blew half the sun away. We’re doomed! Well spotted. It does look different. Is the polarity of 1429 the opposite of sunspots in the NH in Cycle 24 (the magneto image shows t he ‘white’ area leading the black) or is that the result of some process between 1429 & 1430? 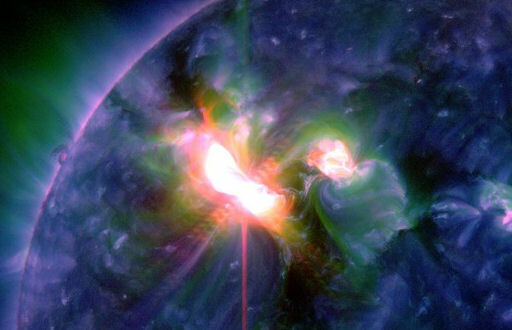 Last night’s BBC Horizon program about solar storms was definitely on the alarmist side – what a surprise! Still, I suppose solar scientists need ever-increasing government funding, just like climate scientists. Much of the program gave the impression that solar storms would increase over the next few years. I assume they were simply referring to the fact that we’re approaching solar max – but without mentioning the small factoid that the sun is in fact in a state of very low activity. However, right at the end, one scientist did mention this and remarked that possibly there would be a reduced danger of solar storms in coming years. So, overall, there was a reasonable balance, although there was still no shortage of alarmism. I wonder if someone could answer this obvious question. What is the correlation between the overall state of solar activity and the likelihood and magnitude of solar storms? Does low solar activity mean less severe solar storms, as one might expect? On the other hand, there have been some major storms despite very low overall activity, this current one being a case in point. Don’t worry about it. You see we have this protective belt of CO2 which is going to back radiate that lot right back where it came from. Isn’t physics wonderful? 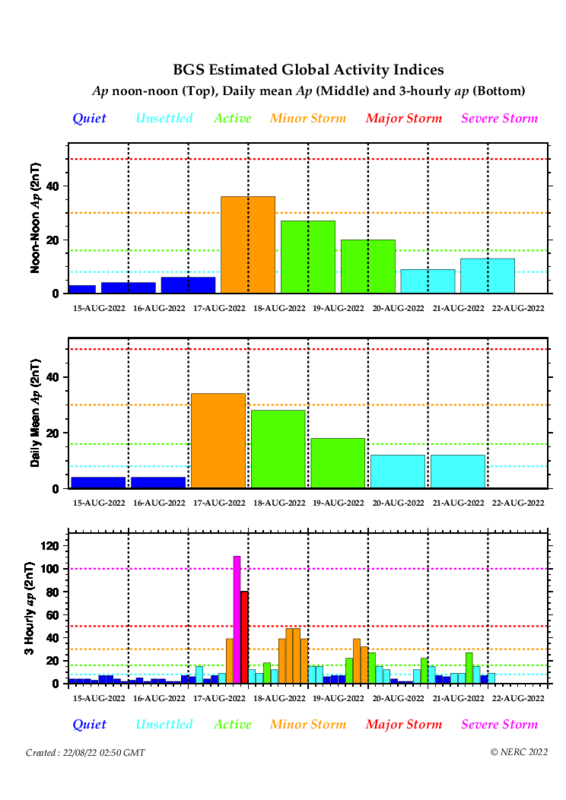 The Dst index of magnetic activity (only solar storms that affect the Earth’s magnetosphere) has good correlation with solar cycle, but strong CMEs and X-class flares can occur at any time. and of all the times for Noaa to decide to go offline and tidy up their system? anyone else noticing the quakes occurring as the CMEs do. 2012-03-07: A strong blast of propaganda was observed to be emitted from the surface of NASA in Boulder, Colorado. It is expected that this propaganda stream will impact plasma screens all over America. When the impact occurs, susceptible people will exit their residences expecting to see Northern Lights; other susceptible humans will panic and sell all their worldly goods. If I am not mistaken, here appears to be something wrong with the plotting of the latest point on NASA’s Spaceweather sunspot count graph. The point seems to have been inserted prior to the previous point, instead of after it. Yes, that is a clerical error, I’ll let them know. As an amateur sun watcher, I would take a stab that the Carrington Event was at least X100 or so (no kidding)– we haven’t seen anything like it again (yet). The Carrington event had a large influence on the Earth because [by chance] there was a very large southward component in the solar wind blob that hit us. “solar experts expect violent solar storms over the next two years” but no explanation why. The next two years will be the maximum of cycle 24. Sometimes active regions rotate and twist and wind up their magnetic field resulting in production of many flares. 1429 is an example. 3% of all spots have reversed polarity. In our prediction paper http://www.leif.org/research/Cycle%2024%20Smallest%20100%20years.pdf we note: “Average space weather might be ‘milder’ with decreased solar activity, but the extreme events that dominate technological effects are not expected to disappear. In fact, they may become more common. Two of the eight strongest storms in the last ~150 years occurred during solar cycle 14 (Rmax = 64) [Cliver and Svalgaard, 2004], while three of the five largest 30 MeV solar energetic proton events since 1859 [McCracken et al., 2001] occurred during cycle 13 (Rmax = 88). What is also of interest is the positive part of Dst that measures the strength of the CME ‘blast’ [by its compression effect on the magnetosphere]. That strength is very constant over time: no solar cycle, no long-term variation. This makes sense because the CME happens on the Sun when things get wound up enough to explode, so CMEs don’t grow too big. Now waiting for you [or some other turkey] to claim there is a strong correlation between the too turkey indices. Piers Corbyn does – he’s been predicting long-range weather and earthquake activity for some time now as there is a strong link. Dramatic changes on the sun get headlines and BBC programmes but the sun is always interacting with our upper atmosphere, and I don’t just mean by TSI. It’s that interaction that drives our climate, moves the jet stream location and in conjunction with ocean temperature transfer causes our climate variations. Co2 is a bit player, but it’s small effect is swamped by the sun’s slightest cough. Obviously you are not well informed on the stock market trading models. Should read up on William Delbert Gann, one of the most respectable financiers and also history of your adopted homeland. Do these things have a bigger impact on earth when the solar magnetic field is generally weak? Obviously you are not well informed on the stock market trading models. FYI: There are several broken links on the solar data page: to the Ace data. Hourly Ap index >100, classified as severe storm. It is an unusual and rare event. I don’t know how this one [which I submitted first] has a later time stamp, but never mind, the correct statement is “No, Kp = 6 or more occurs 600 times [on 360 days] during a solar cycle”. the second and stronger storm expected on Friday morning (UTC), appears it may hit head on. Any idea of its polarity, it would make lot of difference. There is a solar tide configuration from Mercury and Venus of <1.6° while solar flare. BTW. The solar tide dynamic of Mercury/Earth is phase locked to the sea level oscillations on Earth. sigh… and my car had a flat tire too. on 10th March 2011 (nearly a year ago). As long as we’re doing a solar thread and Leif is kind enough to offer his knowledge here, I’m curious about hot flow anomalies. Are the effects of HFA’s visible from Earth as exceptional strong aurorae? Were they recently discovered, or have they been known about for a long time? I wouldn’t expect that there’s any connection between HFA’s and Earth’s climate, but are there any regional weather effects, or do these events take place too far outside the atmosphere? Are the effects of HFA’s visible from Earth as exceptional strong aurorae? It seems that they are not rare phenomena, but there is precious little information online about their effects, if any, here on Earth. A non-standard term, used to describe “disruptions of the solar wind flow, lasting a few minutes” [ http://www.leif.org/EOS/2008_grl_L17S03.pdf ]. As they only last a few minutes and are intermittent, then, although they do have a short-lived influence on the magnetopause, their effect is minor and won’t affect the climate. Are the effects of HFA’s visible from Earth as exceptional strong aurorae? Were they recently discovered, or have they been known about for a long time? I forget the rest of your questions. 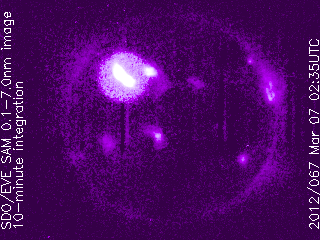 HFA’s are not visible as aurorae, but can be seen as small excursions on ground-based magnetograms. They occur up to a handful of times per month when solar wind speed is very high [above 600 km/sec] and are sudden changes of the direction of the magnetic field in the solar wind, but are otherwise not dependent on solar activity [e.g. the sunspot cycle]. HFAs have been known for more than 20 years, but it is only in the last few years that we have a good explanation for them. There was a sea level high peak on September ~28th 2011 and an opposition of Mercury and Earth on the Sun. This proves nothing more than that a solar spring tide is in phase with global high sea level. Mercury is as relevant as my flat tire. Leif, Many thanks for letting them know, and for your numerous other trustworthy scientific contributions here. With regards, Larry Kirk. I know the answer is likely the same, but just in case I want be a little more specific. Is the impact on earths magnetic field bigger (does polarity and location of impact matter), and does it change the visibility of aurora when the solar magnetic field is generally weak? If Svalgaard and Vulcevic are going to discuss the topics in this thread, then I need to know more to follow the discussion. You got my attention. Please describe the relevant facts that the N – S polarity of the CME has to do with regards to effect on the Earths magnetasphere. Links to detailed explanation and theory would be greatly appreciated. Maybe a little coverage from ‘newbie’ to good understanding. Like I said, you got my attention. See below [partly]. Even if the sun’s magnetic field is weak you can have very bright aurorae, but perhaps not so many of them. In a few words: the solar wind is magnetic; the magnetic field comes from the sun; if the field is pointed in the opposite direction of that of the Earth’s magnetic field where it impacts [on the sunward side] the two fields can connect and the solar wind drags the Earth’s field onto the nightside and into a long ‘tail’, thus storing energy in the tail. This configuration is unstable and when it ‘snaps’, particles are accelerated towards the Earth, where they create electric currents and aurorae. the effect of the currents can be felt on the ground. if the changes are fast enough, new currents are induced in power lines, pipelines, and other linear conductors, with all kinds of bad effects. Some of the cool stuff my cell phone and service provider can do has been shut down, as in service is temporarily unavailable. Sounds like they are putting satellites in protective mode. Thanks, it’s going to be a long and interesting night on my part. Is this perhaps just so much ‘scare press’? Ok, since we’re into measuring things, what is the equivalent coulombs of a large turkey over the area of the earth disk facing the sun during the peak of the current flux, and since we have data on the turkey’s energy, a horsepower calculation would be interesting bit of data and a dandy pick up line. Things would work out differently if this were only a magnetic ‘field’ as opposed to a stream of charged particles … of course, you prefaced this with “In a few words” so maybe the above is part of the economy in verbiage. Um, er, to verify isn’t the solar wind actually a stream of charged particles ejected from the upper atmosphere of the Sun? Are we perhaps conflating perhaps ions/plasma (the fourth state of matter) with material which is a solid mass (one of the remaining three states of matter, comprised of the categories: gas, liquid and solid)? Charged Particle, definition – In physics, a charged particle is a particle with an electric charge. It may be either a subatomic particle or an ion. A collection of charged particles, or even a gas containing a proportion of charged particles, is called a plasma, which is called the fourth state of matter because its properties are quite different from solids, liquids and gases (plasma is the most common state of matter in the universe). Particles either have a positive, negative or no charge (being neutral). I would offer one good example of a ‘charged particle’ in contrast to your chair: the very PC CRT monitor which used to sit upon your desk makes use of thermionicly emitted, charged particles called electrons coming from a heated, oxide-coated cathode element, accelerated by a static 15KV (or so) source towards the Phosphor coated screen, and which said charged particle is able to be deflected by a dynamic magnetic field emanating from a yoke coil around the neck of the CRT. Does the movement of a neutral particle create any accompanying magnetic or electric field? Good test for the Svensmark hypothesis, if decrease lasts day or two. Take note of the current cloudiness forecast for next two days, then compare with the actual events. No, no conflation. The solar wind plasma has an equal number of positive and negative charges per unit volume and is thus neutral. Like my chair. And it doesn’t matter that the chair is ‘solid’. Heat the chair to the temperature of the solar wind [100,000 degrees] and nothing changes. The simultaneous movement of N positive and N negative particles [thus overall neutral] does not create any net magnetic field, or if you prefer: generates two opposite and equal magnetic fields, hence no net. Leif, do you think you have observed 1/1000 of the states our sun has assumed in its lifetime. Or even have proxy data, for same. You seem rather sure of the steady state of our variable heat/gravity source, but I don’t understand why. As far as current states are concerned, what the states were a billion years ago seem of little interest [although we have a pretty good idea what they were]. You seem rather sure of the steady state of our variable heat/gravity source, but I don’t understand why. Lack of perturbation ? As far a gravity is concerned, the sun is VERY stable. The variations we observe are due to the sun’s magnetic field generated by a cyclic, self-sustaining dynamo. Those changes are in energy terms minute. To speculate about the Sun being unstable requires a viable, quantitative theory based on solid physics. Come back when you have one like that. Mercury is as relevant as my flat tire. Has no effect whatsoever. One problem with ‘No’ statements is that there is an owner of the statement; but science is free of personal ownership of claims. Lord Monckton has argued these days on the Argumentum ad verecundiam fallacy; things are not therefore true, because an authority say so. An other fallacy is called Argumentum ad numerum ‘It consists of asserting that the more people who support or believe a proposition, the more likely it is that that proposition is correct’. If L.S. says that there much has been made on Jupiter’s orbital period to the solar cycle or from Venus in context of tidal forces, without any result, then this is not the end of that game. First is to say, that the ‘solar cycle’ (of 1/11.196 years^-1) is caused by the inner geometry of the Sun. Second is to say that the observed frequency shift of the outer gas processes are correlated to terrestrial temperature proxies. This means that there is evidence for a connection between the solar process on the gas surface of the Sun and the global climate on Earth. Not the clock frequency of the inner Sun is relevant for the interactions of planets and terrestrial climate, but the tide processes acting on the surface of the gas Sun. Tide functions are not coupled to orbital periods of the planets, but coupled to twice the synodic periods of two planets, because of a resonance of the two objects. This holds as well for far distant couples and faster running couples. Since satellites are used to measure global observables, for the global sea level this is documented since 1993, was it possible to the solar scientists to compare solar tide functions with the measured global sea level oscillations. Despite the synthetic linear increase, taken from the obvious increase of the whole last century, they would have found, the main solar tide function from Mercury/Earth is mirrored in the sea level oscillations with the same frequency and mostly phase coherent in time. Whatever the mechanism is, that echoes solar tide functions on the global sea level and/or on the global temperature (UAH, incl. land), that there is evidence for a relation between solar tide functions and the terrestrial climate, is a fact. If the argumentation here is shifted to fallacies because of claiming authority in general to knock down the position of the other, I think there is something wrong.